While a baking student puts the finishing touches on her practice cake, an electromechanical engineering student fits wires into a circuit board and a carpentry student sands down his last piece of the day. Humber College students at two campuses are preparing for an upcoming Skills Ontario tournament. They often spend an additional seven to nine hours out of their day, practicing for an upcoming Skills Ontario tournament between May 7 to 9. It’s the start of a trek for a chance at the gold, glory and experience many Humber students before them achieved. Those who qualify at the provincial level move to the nationals in Alberta to earn the opportunity to go to the worlds in Kazan, Russia, next year. Automation technologist and former mechatronic champion Theodor Willert returned to Humber this year after finding success through a job placement at Skills Ontario to coach the mechatronics teams in programming. He said the competition students face this year will be a bit more difficult than usual and students have to be prepared for anything. Willert and his team are excited this year to show off a robot that competes with people to draw pictures of everyday objects. “They are training a lot though and coming in five days a week, and we throw them as many challenges as we can in different ways, so they are as prepared as possible for the unexpected,” he said. 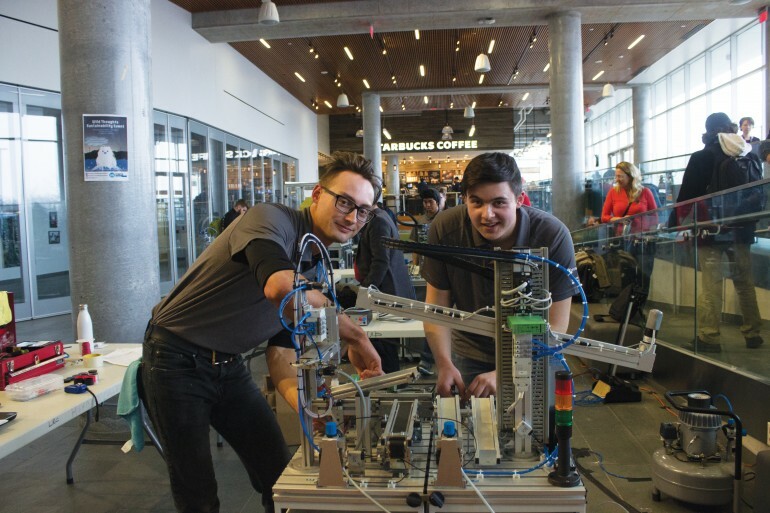 The unexpected is something Humber has adequately been prepared for in the past where mechatronics teams have won a total 22 gold, silver and bronze medals at the national level since 2004. Third-year electromechanical engineering student Mateusz Cwalinski said teamwork is essential for winning as he competes with Bogdan Malynovskyy as part of the senior team this year. “Our characters may not get along with one another, but that’s the biggest obstacle we need to get over,” Cwalinski said. “We’ve been working on it for months and it has improved a lot. “It’s teamwork, so we have to communicate well,” he said. Dean of Applied Technology Darren Lawless is proud of how much the teams have accomplished. He said he believes students are prepared to win gold again this year. Lawless said students don’t get this good by aiming low, but by constantly trying to improve like any varsity, college or skills team. “The program will always be competitive,” he said. “We want to support every student to do it. Brendan Woo, a first-year computer engineering technology student participating in the Skills this year with partner Mahendra Budhu, said Humber’s past success and resources inspired him to come to the college. “The Skills competition, and Humber’s past success in it, are one of the most striking details I recall from my tour of Humber’s open house, and, along with the open Tech Lab, is one of the major factors that made me decide to come here,” Woo said. “I feel optimistic about our chances, if a little nervous as well,” Woo said. Mechatronics and electronics students will not be the only fields Humber is sending to the event. While Humber is sending 37 people from Applied Technology, others from a number of courses including carpentry, electronics, mechatronics, and baking, are also going. Michael Lee, a third-year carpentry student at Humber’s Carrier Drive campus, said he isn’t as much competing to win for the school as he is competing for himself. “I’m competing in Skills Ontario to show what I have to offer and to prove to myself that I have what it takes,” Lee said. “Coming out of this with a job placement would be amazing and a medal would certainly make all of my hard work worthwhile. Although, I wouldn’t say I’m competing to win,” he said. Students of Humber’s well-regarded baking program will be prepared to show off their artistic prowess this year at the completion. 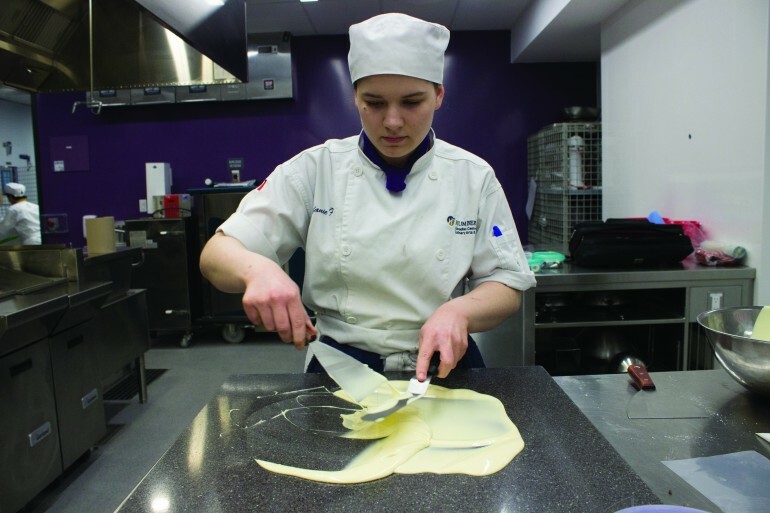 Instructor Chef Susan Joseph said she is proud of Humber’s baking students’ accomplishments in the past and this year they’ll use a variety of different mediums to create artistic showpieces during an eight-hour competition. “[Students] have to be organized, they have to have good attention to detail. They have to be proficient at most bakery and pastry applications, and they have to be good at time management,” she said. Stefanie Francavilla, a second-year baking and pastry student and contestant, said she is preparing her recipes and training rigorously, completing a few dry runs in the span of eight hours. “You have to find the recipes you want to use and then you have to practice the recipes to make sure they make just the right amount,” she said. Expectations are high as she — with teammate Yosselin Appolini — enters the competition for her second year. The message from this group of diverse students is that those considering coming to Humber shouldn’t be afraid and go for it. “It’s very time consuming, I spend a lot of time because I want to do well, but a lot of it is just proving it to myself that I can do better and that I can do a really good job,” Francavilla said. “But, it’s a really good experience, and I recommend to do it if they get the chance,” she said.